Each team operates a two board system. One board for demand and one board for delivery (supply). The majority of the backlog is on the demand board and organised by the various stakeholders. The image below only shows the delivery boards. 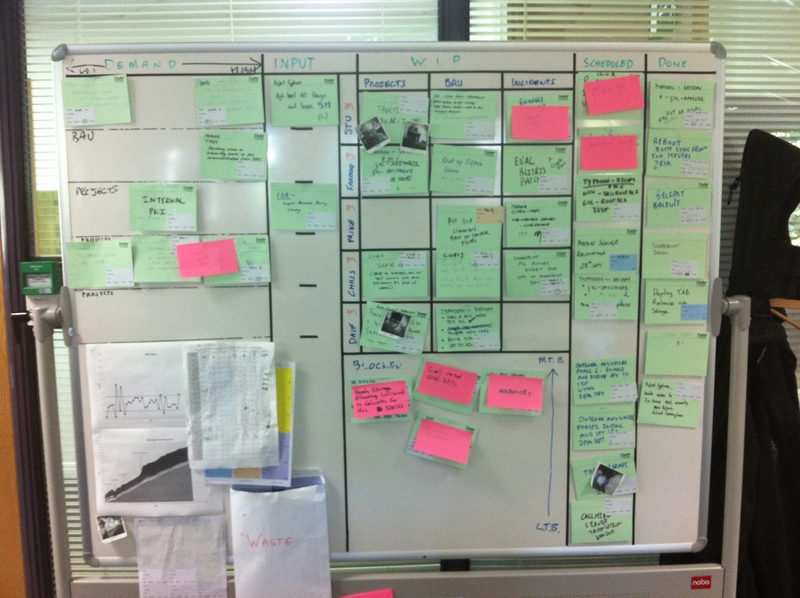 Each delivery board has a part of the demand board on it so as to act as a funnel for the incoming work. Team members pull work from the Input column only when they are ready to do so. If they get blocked on a piece of work then they first focus on unblocking the issue or assist other team members with their tasks. This particular team opted for a grid based layout (following pressure from management!) to include their individual names so everyone could see who was working on what. Initially it drove some wrong behaviours from management seeing an empty slot and trying to get it filled. This wrong behaviour was resolved by making an explicit policy around the purpose of the board and ensuring everyone was bought into it and honoured it. After several attempts by myself to remove the names, the team actually had many reasons why they wanted to keep the swim lanes. However wrong it feels, this setup actually works well for the team. As you can see, they still have avatars which allows them to swarm around the board where necessary. This section of the board with lots of cards with magenta post-its on it is the long term blockers area. This team deals with many 3rd parties and regularly get blocked whilst waiting for the 3rd party to complete something. Unfortunately, the contracts with these 3rd parties do not provide enough leverage to get them to respond quicker so the team could only make them visible. Making them visible enabled senior management to see exactly who was blocking them and chase suppliers on a daily basis, applying pressure where possible. The team have stuck a paper based form to the left of the board to simplify the generation of a Cumulative Flow Diagram (CFD). They find it easier to write the card count for each column on the form and then update the electronic chart periodically – say at the end of each week. Can you pls help explain the kind of cards that went into the Waste Envelope in your scenario? I have always had trouble discreetly identifying them. for these teams it is mostly straight forward – if work is started, i.e. in the WIP column and ends up never getting out of this column due to not being required anymore then its waste. The team write on the card how many man hours/days have been spent. The reality is very little waste has been identified – in the order of 1 to 2 cards per month, although one team had a project canned which clocked up 16 man weeks of waste. Yes, indeed. Infra is the ticketing tool used by the whole department. In theory it’s a great tool – but the reality is it drives the wrong behaviours just like every other ticketing tool in the industry. They all operate on a push mechanism and even contain functionality to automate the pushing of work around the system – automated chaos!